Every year they are involved in accidents that kill thirty people and seriously injure seventeen thousand.1 Before you let that statistic scare you into using another route, remember that you are fifty times more likely to get hurt taking the stairs. Also, half of these deaths involve people who are working on elevators.2 Falls or being caught by the moving parts of elevators causes most of these deaths. Article 620 of theNational Electrical Codehas evolved through the years in an effort to prevent these injuries. Changes to Article 620 were fairly simple. You are now prohibited from installing the elevator lighting on the load side of a ground-fault circuit interrupter. Motor overload protection must conform to Part III of Article 430, in addition to the requirements of 620. Overload protection using 430.33 is optional now. Definitions of control room, control space, machine room and machinery space were added in 620.2 (see figure 1). These separate branch circuits provide a measure of safety to those maintenance persons working on the elevator. The separate branch circuit allows the isolation of circuits during the maintenance process. In addition, the circuit being used for the A/C and heat units used in the elevator car must be dedicated to that heating and A/C equipment. When inspecting power wiring for elevators, start by identifying the components of an elevator system. The elevator will have a car and a hoistway, which the car travels up and down inside. You will also need to locate the machine room or machine space and the control room or control space. Locate the elevator motor controller. If it is outside the hoistway and in a space you can walk into, it is the control room. Otherwise, it is the control space. Use the same method to determine if the mechanical equipment is located in the machine room or space. The wiring method used for the elevator, hoistway and these rooms or spaces must be on this list. Some of the elevator equipment requires a flexible wiring method. Flexible metal conduit, liquidtight flexible metal conduit or liquidtight flexible nonmetallic conduit can be used, as long as the length is limited to 6 feet or 1.8 meters. Liquidtight flexible nonmetallic conduit can be used in lengths longer than 6 feet, but only on the car or in the machine and control room/space. Flexible cords and cables are permitted with some restrictions. They must be components of listed equipment and they are limited to circuits operating at 30 volts rms or less, or 42 volts dc or less. These cords and cables are also limited to lengths of 6 feet or less. Hard-service cords and junior hard-service cords can be used for flexible connections in the car without voltage restrictions. Cables used for Class 2 power-limited circuits can be used as long as they are properly supported and protected from physical damage. An important point to note, no matter what wiring method is used, only wiring associated with the elevator or required by another code (i.e., fire codes) can be located in the hoistway, machine room/space or control room/space. The only exception is wiring that bonds the elevator rails to a lightning protection system. 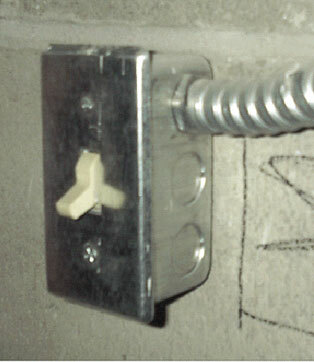 The down conductors of the lightning protection system cannot be installed in the hoistway. The main feeders for the elevator can be installed inside the hoistway, but only with special permission or if the driving equipment is located in the hoistway. As in all parts of the Code, conductors must be large enough to carry the designed load. Normally, 24 AWG copper is the minimum size you can see. Smaller sizes are permitted if they are listed for the purpose. Lighting requires a minimum size of 14 AWG copper. Although it is compliant to install parallel conductors as small as 20 AWG copper, as long as the combined ampacity equals the 14 AWG. Use 620.13 to determine feeder and branch-circuit conductor sizes. Electrical equipment must have working space provided according to 110.26(A). There are exceptions to the working clearance requirement in 110.26(A) that apply if it is ensured that only qualified persons are working on the equipment (I hope only qualified people work on the elevator I ride). These exceptions include equipment that can be repositioned and wired with flexible wiring method, equipment that can be serviced while guards are in place, and equipment that has uninsulated parts operating at 30 volts rms, 42 volts peak, or 60 volts dc. When inspecting the hoistway, look inside the pit access door or open the lowest level elevator door. You must see a lighting switch in a readily accessible location. When you turn this switch on, you should see at least one 125-volt, single-phase, GFCI-protected duplex receptacle located in the pit. Trip the GFCI receptacle. Be sure the light stays on. The light cannot be installed on the load side of a GFCI. Inspect the wiring methods used in the hoistway. Make sure it is one of the permitted methods listed above. Be sure that you see only wiring associated with the elevator. The traveling cables should be installed so that moving parts of the equipment will not likely damage them. Guards may be required to help protect the traveling cable. breaker”” capable of being locked in the open position. 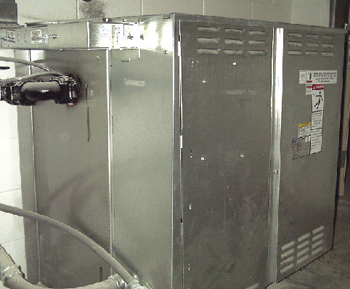 You should see another disconnect (with the same requirements) if the elevator you’re inspecting has a heating or A/C unit. The heat A/C unit must have a dedicated branch circuit. Any other utilization equipment associated with the elevator must have a disconnect in this space, although its only requirement is to be capable of being locked in the open position. Installing these disconnects in this location allows the service person to quickly locate them. Each of the disconnects requires a sign that identifies the location of the supply-side overcurrent protective device. If there is more than one elevator in this location, each disconnect must be identified with the car they are associated with. The elevator car must be wired with the same options listed above. The wiring must be suitably supported and protected from physical damage. Verify that the car lighting is not installed on the load side of a ground-fault circuit interrupter. A person can easily be hurt if the equipment he is working on starts inadvertently. To prevent this from happening, there are requirements for one or more disconnects. Look for a listed, enclosed, externally operable, fused motor circuit switch or circuit breaker that is installed in the main power supply conductors. This disconnect must be capable of being locked in the open position. It must disconnect all ungrounded conductors and be designed so that no pole can operate independently. It must be installed in a readily accessible location within sight of the controller. Turning off this disconnect must not remove power to any of the required lighting in the car, hoistway, or controller/machine rooms or spaces. A person working on a driving machine or motion and operation controller located out of sight of the first disconnect, must be able to prevent it from operating. 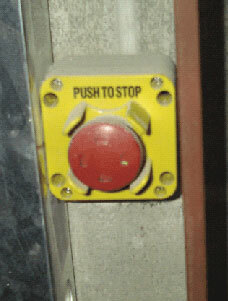 A manually operated switch installed in the control circuit to prevent starting will provide this extra measure of safety. This switch must be located adjacent to the equipment. All elevators with driving machines located in a remote machine room or space must have another disconnecting means installed. This disconnect must also open all ungrounded conductors and be capable of being locked in the open position. 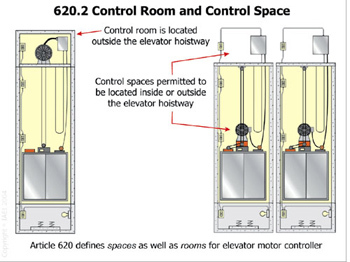 As you can see, many of these requirements are in place to prevent the branch circuits and lighting associated with the elevator from being turned on or off without the maintenance person’s permission. The Code requires the motor controller and other equipment associated with the elevator to be located in a manner that would prevent unauthorized access (such as behind locked doors or panels). The electrician can help prevent injuries caused by elevators if he installs the electrical equipment according to Article 620. The inspector can also contribute by verifying the installation meets the requirement of this article. I’ve given you a start and covered many of the basic requirements of the article. There are other, more specific, requirements that you may need to enforce for the installation you are inspecting. Read the Code and take the book with you so you can refer to it during your inspection.